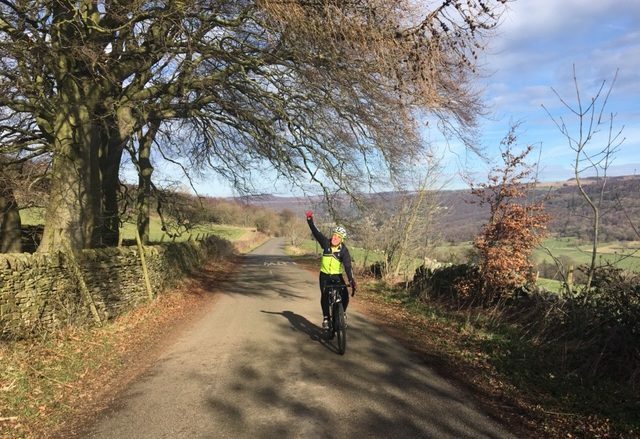 Bryce riding up New Road on the way to Eyam on Thursday 21 February 2019. What a day – 16C!!!!! No wonder he is happy. Don the club colours and immediately you become an Ambassador of the sport. One should always show respect for fellow riders and other road users alike. Most of us are also car drivers and hopefully accept this premise, but occasionally we do not fully engage our brains. Even the most experienced club rider will, on occasion, make a mistake. The following is intended to give suggestions with the object of minimising risks and encouraging people to ride safely, individually, or as a group. Potential hazards are then kept to a minimum. ALWAYS OBSERVE THE HIGHWAY CODE. Do not ride on the footpath. Aim to be seen by other road users by the wearing of bright clothing. Try to avoid passing motorists on the inside at junctions. When approaching horses especially from behind, please give prior warning. Do NOT ring your bell, horses do not like bells! Do not react to incidents of bad driving with gestures, or provoke retaliation. A motorist possesses a bigger weapon. Recommend a size not exceeding 15 riders: should that be exceeded then 2 groups should form with at least 1 minute gap between. This helps facilitate vehicular overtaking and maintain flow. Some clubs group out in 5’s on busy roads leaving 50 yards between groups for vehicles to pass. Before departing on a ride, it is recommended for a “Sweeper” to be nominated. His duties include monitoring numbers, observing other incidents and reporting ahead. All riders should warn fellow riders both verbally and the use of hand signals of potential hazards, e.g. potholes, glass, hedge cuttings etc. ‘Car Up’ or ‘Car Back’ when vehicle approaching from rear. ‘Car Down’ or ‘Car Front’ when vehicle approaching from front. ‘Stopping’ self explanatory. When a group stops, move off the road and avoid stopping at hazards such as bends in the road. Do not ride more than 2 abreast. Do not overlap wheels. Overlapping forwards gives no chance to avoid the rider in front if he swerves to avoid potholes and is equivalent to riding 3 abreast. It is advisable to refrain from “waving through” a following vehicle that is waiting to overtake. Let the driver make that decision. This will avoid being held responsible if the overtaking manoeuvre results in an accident. By following correct Etiquette we will not be providing ammunition to the anti-cyclist lobby. Remember, that just as we tend to notice the inconsiderate or bad drivers, so other road users see poor behaviour of some cyclists. By following the above suggestions, we are encouraging motorists, pedestrians and cyclists to establish a climate of mutual courtesy. It is advisable for riders to carry a ‘live’ mobile phone on which ‘In Case of Emergency’ (ICE) numbers should be stored. Carrying easily accessible details of any Medical condition/Medication should always be a consideration. Wearing of helmets is most strongly recommended.